"Stiles is a serious and accomplished biographer, but he is more than that. He is a skilled writer." Click on the menu above for more information about T.J. Stiles, his award-winning books, his essays and reviews, and his speaking engagements. I am a biographer. That means my identities as a historian and author are inextricably bound together. I like to tell good stories and ask big questions. To put it another way, I try to work in the space where scholarly and literary virtues overlap, where new knowledge and art (or, at least, the enjoyable narrative) enhance each other. That's why I write biography. Academic historians often feel ambivalent about biography, haunted by Thomas Carlyle's claim that history is made by "great men." But I find it to be the perfect form for what I want to accomplish. Loosely speaking, I have three goals for each book I write, none of them purely scholarly or artistic. First, I'm interested in writing books that succeed as books—that is, as an immersive and satisfying reading experience. As a biographer, I have an implicit contract with the reader. I am delivering the story of a life—a story about human beings. It has a beginning, a middle, and an end. There will be actions, accidents, choices, and consequences. Everything I do must serve that life story, and give the reader a reason to keep reading the next page, the next paragraph, the next sentence. When I provide contextual information or explanations of the significance of particular events, it must all be part of the propulsion mechanism. It can't be dead freight that weighs down the reader's journey. Second, I want to understand what it means to be a human being traveling through the world. Scholarship is generally interested in humanity in the aggregate; literature is interested in the individual, and finds the universal through the very particular. Unlike the novelist, of course, I write about real people, so I always struggle against the barrier that E.M. Forster described—the surface that divides the depths of inner experience from outward action, the hidden from the knowable. I follow the scholarly rules of evidence but pursue the literary goal of understanding the personal experience and immersing the reader in the sense of having lived another life. That requires deep reading not simply of letters and diaries but of the historiography about the era in which the person lived. Finally, I find biography to be a necessary form for exploring history. Human beings don't respect the artificial boundaries that disciplines erect. People's lives blast right through the checkpoints of periodization, region, or subject. I've torn up drafts of chapters because I discovered that I hadn't mastered a broad enough field of knowledge, hadn't extended my reading and research far enough back in time. Every life connects to the world, reflects the world, in countless surprising ways. From both the literary and the scholarly perspectives, that's what's so wonderful about biography. What defines the United States? What has made the modern world? Where do we get our ideas of right and wrong—and who argued against them? I like to say that history is about everything. You never simply write history—you write about what matters to you. My interests are intellectual and moral. I want to understand the emergence of our most basic concepts, ideas so fundamental to how we organize the world today that we take them for granted. Many of these have a moral dimension. I'm definitely motivated by a sense of right and wrong, yet I try to understand where my sense of right and wrong came from. What I've found (to no historian's surprise) is that everything we take for granted today emerged out of bitter conflict. My first biography is a study of violence in our past and also of the making of our ideas of race, equality, and freedom. It led me into economic questions in my second book—not only the roots of present-day prosperity and inequality, but the making of our financial universe. How did we come to organize so much of our lives through abstract concepts? What exactly is a corporation? Why do accept completely intangible money and assets? My third book incorporates all of these questions, and adds in the struggles of women, how we view and use the environment, and the collision between two world-systems (to borrow a term from Immanuel Wallerstein) that is so often reduced to the term "Indian wars." Even more explicitly than the first two books, Custer's Trials is about the making of modernity, and one of its discontents. And, as I mention above, I want to know more about the human condition—the universal that emerges out of the particulars of one life. We come closest to grasping that through good writing. So, writing, yes, I definitely care about writing. 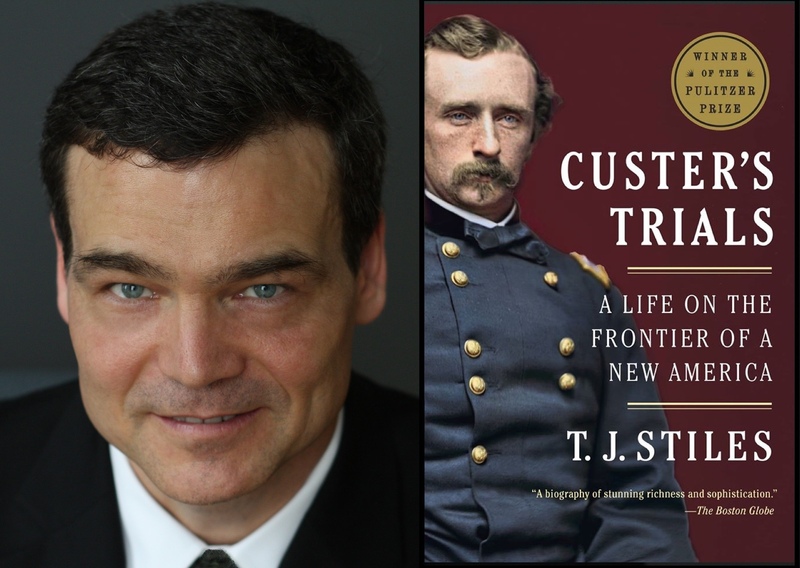 T.J. Stiles is the author most recently of Custer's Trials: A Life on the Frontier of a New America, winner of the 2016 Pulitzer Prize for History, the Spur Award for Best Western Biography, and the William H. Seward Award for Excellence in Civil War Biography. It was a finalist for the Pulitzer Prize for Biography, the National Book Critics Circle Award for Biography, the Guggenheim-Lehrman Prize in Military History, and the California Book Award. It was published in hardcover by Alfred A. Knopf and in paperback by Vintage. He also wrote The First Tycoon: The Epic Life of Cornelius Vanderbilt, winner of the 2010 Pulitzer Prize for Biography and the 2009 National Book Award for Nonfiction, and Jesse James: Last Rebel of the Civil War, winner of the 2003 Ambassador Book Award. He is currently working on a biography of Theodore Roosevelt. • Alfred A. Knopf, Inc.